When I was pregnant I spent hours upon hours scrolling Pinterest and making plans for how I was going to make homemade baby food and provide fresh food and gourmet level toddler options for BabyCakes at every meal. Once she was here, that became a littler harder to keep up with! While I don't have the time to make dinosaur shaped sandwiches or mini green smoothies for every meal there are store bought solutions that are quality and fit into my life as a working mother. One of my favorite brands is Annie's Homegrown. I first encountered them when I was watching YouTube videos from other moms and noticed that most of their children loved the Annie's Cheddar Bunnies. Annie's uses natural and organic ingredients to make great-tasting products for the whole family, not just the kiddos. They are also a socially responsible company, sourcing ingredients in sustainable ways. I want to feed my family as best as I can and Annie's makes it easier to give them organic food. Their mac and cheese is a go-to for dinner time, and I like to use their snacks when packing BabyCakes' lunch. A great choice for lunches during this back-to-school season is bento boxes. I love them because BabyCakes eats more when I provide her with a variety of items. This box is a perfect composition of some of her favorites: strawberries, an Annie's Chocolate Chip Chewy Granola Bar, cheddar cheese rods, chicken nuggets, and Annie's Berry Bunny Cereal. I feel comfortable giving BabyCakes Annie's snacks because both of these products have no artificial flavors, synthetic colors or preservatives and no high-fructose corn syrup. Also in the production of the Berry Bunnies Annie's works with trusted suppliers to source only non-GMO ingredients. Even though the products are organic there is no sacrifice in taste. BabyCakes loves them. A lot of stress comes with parenting. You wonder every day if you are doing the right things, giving them the right food, teaching them enough, etc. I look for any products that can support me in making confident good decisions for my daughter and my family. Annie's Homegrown products is a brand that helps me with that. Eating organic is important to me for both my family's bodies and for the environment. Head to your local grocery store and try some Annie's products for yourself and click here to check out other bento box lunch ideas! 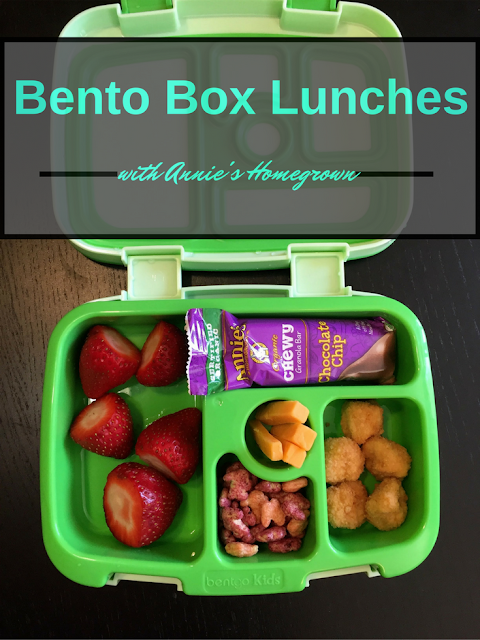 My son loves Bento Box lunches & Annie's too!